In late November, Macular Society hosted a professionals' conference focused on the latest in macular treatments, patient experience of the eye clinic and sharing best practice. Hannah Adams, NB Online editor went along to the conference to find out about some of the work happening in the field. Over 100 ophthalmic nurses, rehabilitation officers for visually impaired people, eye clinic liaison officers and third-sector workers gathered on 28 November 2017 to attend the Macular Society’s professionals' conference dedicated to age-related macular degeneration (AMD). It was exciting to hear from Claire Bailey, Consultant Ophthalmologist at Bristol Eye Hospital, who shared updates happening within the field of research. Dr Bailey spoke of several phase-two drug trials including research into new treatment options which could see anti-VEGF injections being administered to patients with wet AMD on a quarterly rather than on four-or six-weekly basis. Dr Bailey also spoke of the STAR study, which is investigating whether Oraya Therapy can maintain vision while reducing the required number of anti-VEGF injections. The procedure uses low-energy, highly targeted X-rays to treat wet AMD and is intended as a one-time procedure. Pearse Keane, NIHR Clinician Scientist and Honorary Consultant Ophthalmologist at Moorfields Eye Hospital, introduced delegates to the Moorfields partnership with DeepMind. Research is being carried out into technology that could help to analyse eye scans, giving clinicians a better understanding of eye disease. By sharing one million anonymous OCT scans, it is hoped the DeepMind technology will help lead to earlier detection and treatment for patients and ultimately help to avoid cases of preventable eye disease. Results of the project will be published in 2018. Next on the programme was an AMD Patient Panel; four people with macular conditions shared their sight loss story and varying experiences of eye clinic care. Each offered recommendations of what excellent care should look like for all practitioners to take back to their teams. Where possible, always signpost patients to third-sector organisations who can offer emotional and practical support. 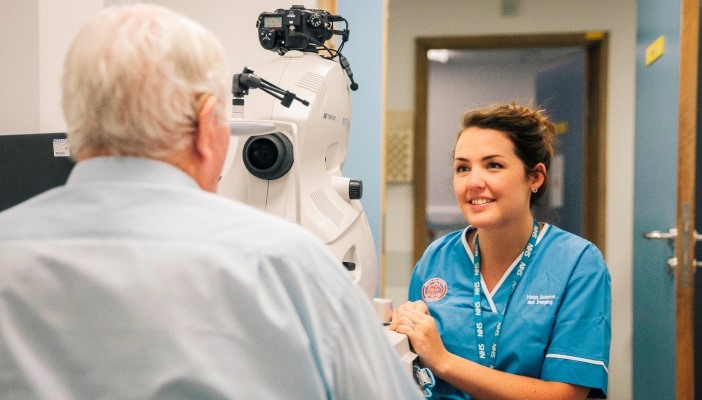 Sarah-Lucie Watson, Consultant Ophthalmic Surgeon at the Royal Berkshire Hospital, had an incredibly simple but effective resource to improve blind and partially sighted patients' experience of visiting the hospital. At the Royal Berkshire Hospital, a sticker of an eye is attached to the front of patients with a sight condition’s records. This alerts all hospital staff to the fact they will need to tailor their care so it is accessible. Inside the patient’s record, a yellow front sheet then sits on the top of any notes. The front sheet gives tips for staff who might not know about sight loss about how to provide accessible care, i.e advice about lighting and how to explain where the patient's food and drink is. Clare Thetford, Research fellow at the University of Central Lancaster, spoke about a 14-month research project she is working on that focuses on community-based peer support. The objective of the research is to find out what best practice looks like by reviewing a series of factors including how support is delivered, how much support is offered and what the barriers and enablers are to people participating. Rakhee Shah, Optometrist and Lecturer from City, University of London, spoke of the Prevalence of Visual Impairment in People with Dementia (PrOVIDe) study. PrOVIDe found that prevalence of visual impairment in those with dementia is generally higher than for the overall population, highlighting the importance of sight tests in this group of people. The Macular Society has been supporting members for over 30 years. Find out more about the Macular Society's work.